Consumer perception is a tricky thing to comprehend, let alone predict. It’s difficult to understand the way the average consumer thinks, to put yourself into their shoes and figure out why they make the decisions they do, especially when you’re as invested in the product as a designer, developer, executive, blogger, or fan might be. There’s been a lot of chatter about the pricing for the upcoming HP TouchPad webOS tablet, with a lot of disappointment about how it seems like they are shooting to match the iPad on price and not undercut it by up to a hundred dollars. While there are many factors that could enable HP to lower the TouchPad’s price and take a loss while shooting for increased market share, such a move could seriously backfire. Customers are used to paying full price for a tablet, unlike in the phone world where the cost is subsidized over time. Like when buying a car of a house, they ask themselves, “Why is that one so much cheaper?” The same happens with electronics (especially computers), though most of the time there are specs that can be compared on an apples-to-apples basis, with only a portion of the cost accounting for less quantifiable items like build quality and aesthetics. If you place a TouchPad and iPad 2 next to each other, the comparison is interesting. The TouchPad has a better front-facing camera, while the iPad 2 adds a rear-facing unit that’s not that great. 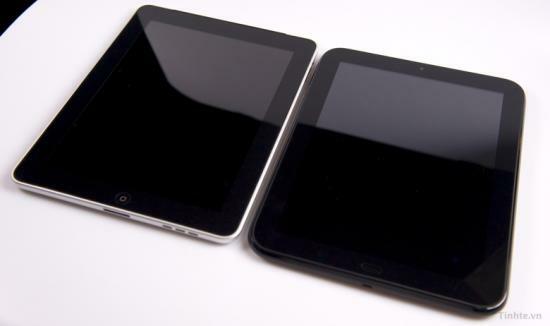 The iPad 2 is thinner and lighter, and made of machined metal compared to the TouchPad’s plastic shell. The TouchPad has a dual-core 1.2GHz processor compared to the iPads 1GHz dual-core chip, and they match each other in RAM, storage capacity, and screen size and resolution. The iPad has a monstrous advantage on the apps front, while the TouchPad appeals to users seeking a seamless ecosystem between their phone, computer, and the cloud (even though most don’t know nor care what “the cloud” is, they just want it to work). Physically, sitting next to each other on a shelf, the two devices are close enough that the average consumer would expect them to be equally priced. Most buyers are more saavy and skeptical than salespeople, bloggers, and techies give them credit. They may not speak in terms of GHz and GB and PPI, but they can make comparisons of how the well the device actually works (which in the end is more important than the number of GBs). So when the potential buyer is presented with two seemingly equally-matched tablets, one priced $50 or $100 lower than the established competitor, they’re going to ask the question of “Why?” The average consumer doesn’t think in terms of marketing, so the question of what does this price mean inevitably results in the conclusion that it’s somehow an inferior product. It’s like that surprisingly cheap car or too-good-to-be-true house, for all they know there’s flood damage and termites. In the case of a tablet, less expensive at the same size equates to cheaper. Of course, all this setting the price equal to avoid the perception of inferior quality won’t mean a darn thing if it’s actually inferior quality. The average consumer can see that, and HP’s going to have to make sure the plastic body of the TouchPad can measure up in endurance, and more importantly, solid feeling with the iPad. HP’s own design guidelines for the TouchPad set out with the iPad squarely in their sights. Matching and exceeding the iPad won’t matter for much if consumers are confused by the message sent by the price.